Alastair James Taylor was born in Alves, Morayshire on 19 December 1922. 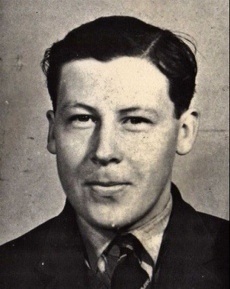 He was the older of the two sons of Stephen and Sarah Taylor, and his brother also served in the RAF. His home village was just a few miles from two locations – Kinloss and Lossiemouth – which would become very familiar to the personnel of Bomber Command in the war years. He went to Elgin Academy.. He joined the RAF as an apprentice at RAF Halton in January 1939, and served in ground crew until selected for flight engineer training at No 4 School of Technical Training at RAF St Athan in the summer of 1942. After qualification, he was posted to 1654 Conversion Unit in December 1942, where he crewed up with Vernon Byers and his colleagues. The crew arrived at Bottesford to join 467 Squadron on 3 February 1943, and had flown on just three operations by the time they were posted to 617 Squadron at the end of March. ‘Beating up’ family houses was quite common in wartime. If they had a close relative in the RAF the occupants would listen out for aircraft. They would then rush outside if one flew over very low. It was usually a sign from the relative that everything was OK. The wave from the cockpit was probably the last time that Taylor and his mother saw each other. A few days later AJ-K set off on its fateful flight on the Dams Raid, and was shot down even before it reached the Dutch coast. Like five of his colleagues, Alastair Taylor has no known grave, and is commemorated instead on the Runnymede Memorial. God bess him and his crew. God bless him and his crew…………………..Sorry. Another great post Charles .